The staff were very helpful and friendly! The location was perfect! Such a beautiful place! Will definitely return again soon. I loved the bath in the master bedroom and the lovely floors and decor. The swimming pool was awesome - big enough for a play and laps if you were feeling energetic. the 3 bedroom apartment was very spacious and having a balcony with each room made them feel even bigger. very close to Airlie, restaurants and our ferry. The fact that you can order food to your room. Staff were super helpful and friendly with all our little requests and first world problems. Super spacious, beautiful design, comfortable and clean. Had a great stay here, location was fantastic for the Whitsunday day cruises. great location and views ease of access from boats . Helpful and lovely staff. The room is super cozy and equipped with sufficient tools, cooking tools especially if you’d like to cook by yourself during a vacation stay. Downstairs you will find some very nice restaurants and bars for a proper dinner or a quick drink. And the hotel is just beside the Airlie port marina, which makes it quite easy if you go on a boat trip. From the booking to the location to the staff to the rooms - everything was perfect. Definitely will stay there again when next in Airlie. Views were amazing! Staff were lovely - they even gave our two children Christmas gifts! Kids had a ball, and loved the pool! Lock in a great price for Mantra Boathouse Apartments – rated 9.1 by recent guests! Mantra Boathouse Apartments This rating is a reflection of how the property compares to the industry standard when it comes to price, facilities and services available. It's based on a self-evaluation by the property. Use this rating to help choose your stay! Located on Port of Airlie Marina, Mantra Boathouse Apartments offers private balconies and stunning views of the Coral Sea. This beautiful property features a children’s playground, swimming pool, a tennis court, and BBQ facilities. Guests enjoy 1-hour of free WiFi per 24 hours. Airlie Beach is home to an array of enticing dining options, within 10 minutes’ walk of Mantra Boathouse Apartments. 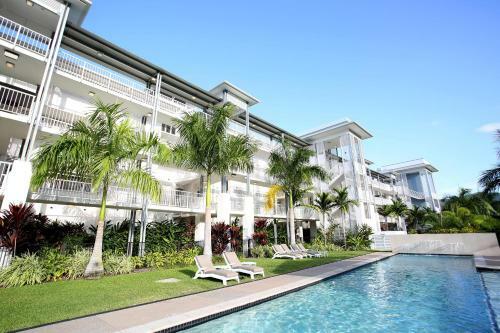 It is 20 minutes’ walk from Airlie Beach Lagoon and 45 minutes’ drive from Whitsunday Airport. Accommodations options include 2 or 3 bedroom apartments. Each spacious apartment offers a bathroom and a flat-screen TV with cable channels. The fully equipped kitchens include a dishwasher, microwave, refrigerator and stovetop. Free on-site parking is available. The tour desk can arrange a variety of day trips and activities including tours of the Whitsunday Islands and Great Barrier Reef. Car rental is also available. When would you like to stay at Mantra Boathouse Apartments? This apartment features 3 private balconies, lovely views of the Marina, and full kitchen and laundry facilities. Please note that rooms are only serviced once a week. This apartment features 4 private balconies, lovely views of the Marina, and full kitchen and laundry facilities. WiFi is available in the hotel rooms and costs AUD 6 per 24 hours. House Rules Mantra Boathouse Apartments takes special requests – add in the next step! A AUD200 damage deposit is required on arrival (around USD143.61). This deposit will be fully refunded 14 days after check-out, as long as there isn't any damage to the property. Mantra Boathouse Apartments accepts these cards and reserves the right to temporarily hold an amount prior to arrival. Please note that this property is strictly nonsmoking, including on the balcony. If evidence of smoking is found, an additional cleaning fee may apply. A damage deposit of AUD 200 is required on arrival. That's about 143.61USD. This will be collected by credit card. You should be reimbursed within 14 days of check-out. Your deposit will be refunded in full by credit card, subject to an inspection of the property. That the dryer did not dry clothes. I had to take wet clothes home. Air con condensation drips to floor near kitchen bench. Also the walk ways and entrance to room were consistently filled with big puddles hence a safety hazard. Location was great, close to main street and a walk to the markets. The restaurants and Coffee Club within the accommodation is wonderful. The apartment was quite large and with all the comforts, there is a nice walkway along the residence and the marina..
Facilities are a bit old. The lift has some problems when we were there. Enjoyed the cleanliness of the rooms, bed was comfy and spacious. Staff were very friendly and accommodating. Full kitchen but limited cook ware. Limited our ability to prepare the meals we wanted. The receptionist who booked us in was not very friendly. Stuff are very strict with checking out time. no flexibility at all. The sofa in the flat was a little grubby and the coffee table a but old but apart from that it was very comfortable and well presented. The location was good, but due to works going on it was noisy on the mornings outside if your balcony looks over the port. The works as well meant parts of the area were in accessible for walking or use of the beach. I thought it was expensive for what it was but I somehow booked a larger room than we needed (it may have been the smallest size they do). Staff were very friendly, whole environment was clean and well presented. We didn't use many of the facilities but the pool looked nice. The receptionist was very helpful in introducing us to the area and the different tours available to us. Location was very good and a lovely view over the port and the ocean.